Russell Brand opens up about how becoming a parent has changed him, and trading his troubadour spirit for domesticity. Larry King: You became a father last year. Has parenthood changed you? Russell Brand: Yes. Yes, it has Larry, because it’s difficult to maintain my personal devotion to self centeredness, when so obviously, I am not the nexus of the universe. That become clear when the baby was born. It’s so extraordinary, both carnal, animal, and somehow divine -- the roaring, the blood, the screaming -- but the presence of something magical. It made me understand Michelangelo’s ‘Sistine Chapel’ in a different way. That it is consciousness that is gifted to us from the ethereal realm, not the material life. When I saw my daughter for the first time, I understood purpose. I understood meaning. Larry King: And dependence. She needed you. Larry King: Has fatherhood changed your comedy? 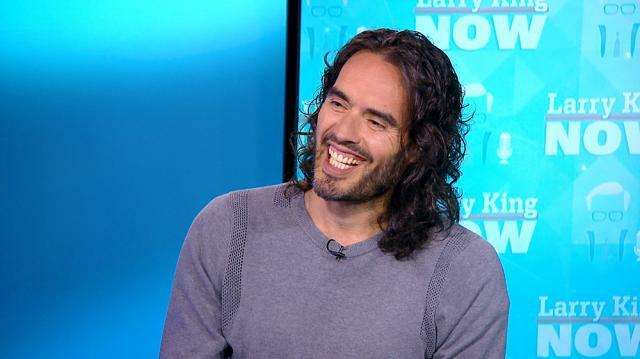 Russell Brand: Yeah, it has done. It has done, because it means it’s changed absolutely everything about me, because now I am anchored, this who I am now. Before, I sort of sometimes used to feel that I had a troubadour spirit, that I could walk out of my house and I might end up anywhere, that I could just meet someone on a street corner -- like Pinocchio with that fox and that cat, he just wandered off with them, didn’t he? Well, now if I meet a fox and cat, I’d have to go “Well, listen lads I’ve got to go home, the baby’s hungry.” So what it gives me is a sense of domesticity in the sense of connection. It’s changed everything. Comedically, I think I can still be filthy and very very rude,but now I know it comes from a sort of a kind of a crucible of connection.